That's it, your app is finished and you want to submit it on the AppStore. You do not want to go through our publication service, but rather the issue with your account iTunesConnect. No worries, it's entirely possible and we can deliver a file IPA that you send to Apple. Here is the procedure to be followed and the elements to provide. Warning, this procedure requires that you have an Apple Developer account and assumes that you have the technical knowledge to carry out the various necessary operations. We have also written guides to generate a distribution certificate and provisioning profile to guide you in this process. First, you must send your application developed TapPublisher. Nothing more simple, run the software on your Mac and click on the Publish. All data related to your app will be uploaded to our cloud and demand for publication will be activated. 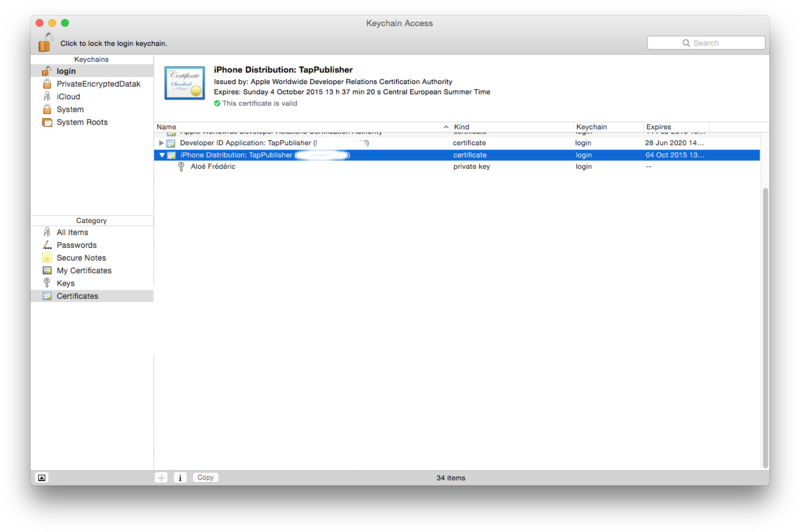 For us to compile an application with your iTunesConnect account, you'll have to send us, through our support, identify your app as well as two files: a Provisioning Profile and a distribution certificate. This information will enable us to compile an application with your identity that you can then submit to Apple. The app identifier is in the form com.mycompany.myapp and must have been created on your Apple developer account . The distribution certificate is the file that will allow us to sign your application with your identity. Launch application Keychain Access on your Mac. You will find this certificate in the left column, bottom, in the category Certificates . His name is in the form iPhone Distribution: your name (xxxxxx) . Select it and click the triangle to "open". You will see that it is associated with a user (probably you). You must export these 2 information. To do this, nothing more simple, select the 2 lines (+ identity certificate), right click on your mouse and click Export 2 items. The backup switch will open and offer to save a file as Certificat.p12 . The application will offer you to encrypt the file with a password. This is not mandatory, but if you do, you must not forget to provide us. 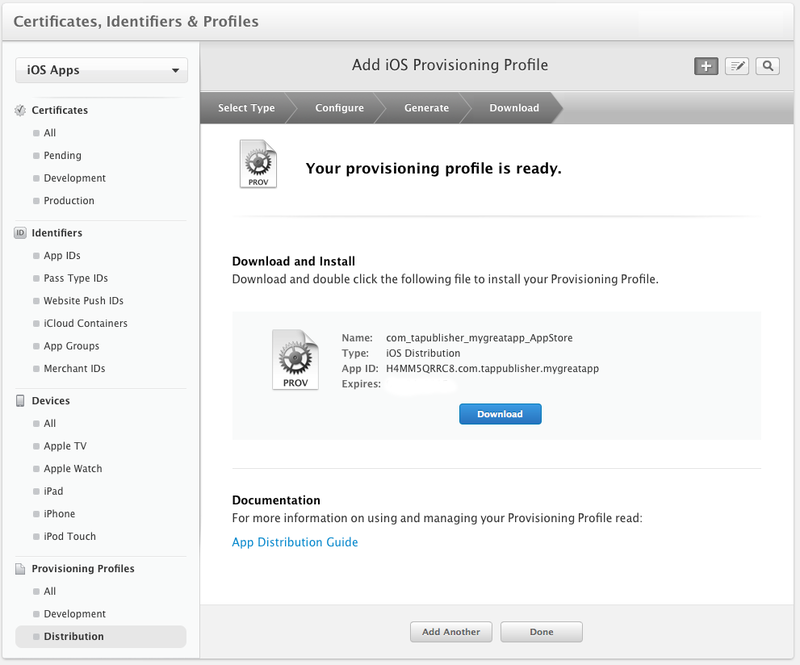 For Provisioning Profile, everything is much simpler since once created in the web interface developer.apple.com, you can directly download it. However, this provisioning must have a very specific name for that we can use with our build system. If the identification of your app is com.masociete.monapp , for example, you need to create a profile with the name com_mycompany_myapp_AppStore . Beware, if you create a provisioning profile with a different name and you rename the file in the Finder, it will not work and it will create a new one. Void so the two files that you should have generated and you must send us. And that's all. With this information, we can compile, sign your app and send it as a .ipa file. You can then submit on the AppStore via iTunesConnect interface. After some time (between 5 and 15 days depending on the time of year), a person of Apple's validation team will check your app to ensure it does not violate any rules made by Apple. If you used TapPublisher followed our advice and in 99.99% your app will be validated quickly and available on the AppStore. And now it's up to you to create a wonderful app.